Secrets of Power Negotiating, 15th Ann. Ed. The mere suggestion of employees working from home is enough to make many managers sweat. Faced with the prospect of managing an employee they can’t even see, many discover that their managerial style just doesn’t work anymore. As an increasing number of jobs can be executed from home, managers must learn how to adapt their leadership style to cater to remote employees. 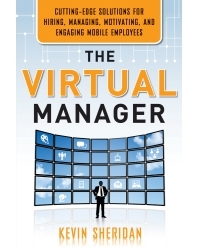 Based on years of research, The Virtual Manager provides any manager with the tools he or she needs to successfully work with virtual employees. Trust us: it’s not like managing office-bound employees! This book is a tell-all user manual for a new generation of managers. Kevin Sheridan is chief engagement officer (CEO) of HR Solutions, Inc., a human capital management consulting firm specializing in employee engagement surveys. Sheridan pioneered the idea of duel-ownership of employee engagement and was the first in his field to address the imbalance that an entire industry had overlooked. He has done consulting for some of the world’s largest corporations and is a frequent speaker at conventions. His work and research have appeared in a myriad of national and international publications. Sheridan received a master’s in Business Administration from the Harvard Business School. He resides in a Chicago suburb with his wife and two daughters. Visit his site here.